Actual size is approx 1 inch tall. 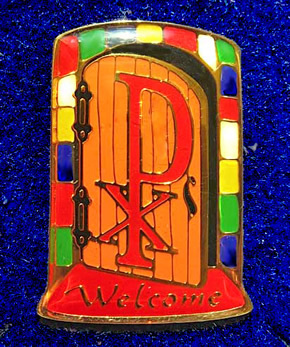 An open door, with a red and gold Chi Rho symbolizing Christ, highlights this unique pin. The richness of the Church, hinged to Christ, is captured by a door frame formed by colorful mosaics. A golden "Welcome" in calligraphy is imprinted on a rich, red doormat.